Although wild salmon stocks have been in decline since the 1950’s, populations are now half of what they were 20 years ago. The advent of poorly managed salmon farms has been implicated in this decline. Alarm has been raised about practices in some salmon farms, notably the discovery of antibiotics, organo-phosphate insecticides and pigmentation chemicals in the feed. 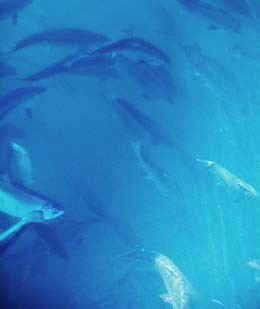 Salmon farming is a global industry often relying on over-crowded stock, mass produced fish with limited respect for the welfare of the salmon and the local environment. The true flavour of this wonderful fish is getting lost in the rush to fill the supermarket shelves. The effects of badly managed salmon farms can be detrimental to the environment and ultimately our health. However, purchasing salmon from small farms that are committed to the principles of total sustainability is still preferable to further exploiting wild salmon stocks. The salmon that Moshi Moshi uses is supplied by Loch Duart. Their methods involve leaving sea lochs fallow for one year in three to allow regeneration through wind and tide. The fish food they feed their salmon is certified as coming from sustainable resources and the salmon are left to grow at their own pace, in conditions 25% less crowded than average commercial cages. Although the resulting product comes at a higher price, we firmly believe that the benefits of better tasting, textured and healthier salmon are clearly borne out in the cost.